Summer is winding down, but it's never too late to find your perfect neroli, right? Here are two reasonably priced options, both released earlier this year, or as always, name your own favorite in the comments. My high hopes for Eau sOleil stemmed not just from the fact that I love the Parfums de Nicolaï brand, but also from the amazing number of my summer favorites they've made, from Balle de Match to Eau d’Été to Eau Exotique to L’Eau à la Folie to Vie de Chateau. This is a brand that knows how to do light and refreshing without dumbing down. Add to that Eau sOleil's focus on neroli — it was said to be “almost pure neroli” — and I'm on board. And the opening is fabulous: a dry but sparkling burst of citrus with mossy and herbal undertones, reminiscent of a classic Eau de Cologne. Alas, after that, it is mostly nice but no cigar, or at least, not for me: it's a relatively tame and somewhat flat blend of floral notes over a pale woody-musky base. It's summer-y and pleasant, and the ylang ylang lends a bit of a tropical vibe, but it's not as lively as I'd hoped, and it's nowhere near as lively as any of the fragrances from Nicolaï that I mentioned in the last paragraph. I wore it next to Atelier Cologne's Grand Neroli, a scent I bought but have not reached for as often as I thought I would — it could be a bit livelier too — and I far preferred the Atelier. Still, fans of the house should give it a try. It's absolutely unisex to my nose, in fact, the person I might recommend it to is the person who was interested in Diptyque's take on ylang, Eau Moheli, but found it too feminine. Like Victoria at Bois de Jasmin (you can see her review here) I would prefer Nicolaï's Cologne Sologne for neroli, although I don't personally adore Cologne Sologne either, and I will say that sOleil has far greater staying power. Parfums de Nicolaï Eau sOleil features notes of bergamot, mandarin, lemon, petitgrain, thyme, sagebrush, neroli, orange blossom, jasmine, ylang ylang, galbanum, patchouli and musk. It is available in 30 ($45) and 100 ($95) ml. For buying information, see the listing for Parfums de Nicolaï under Perfume Houses. Néroli is the latest addition to Yves Rocher's Secrets d’Essences collection (see Voile d’Ambre, Rose Absolue, Iris Noir, Tendre Jasmin, Vanille Noire). Many perfumistas have been pleasantly surprised by the quality to be found in the series: they're generally very well done for the price, and, extra bonus, they can be found in very small sizes for a song. Generally speaking, they smell like fragrances that cost far more. Néroli is lighter and more summer-y than many of the other fragrances in the collection. It's a clean blend of orange blossom and neroli, and almost certainly other floral notes as well. It's not quite bitter, not quite sweet, and has a touch of green. It's mostly linear once the top notes fade, and the base is pale and musky, with a slightly resinous undertone. It's pleasant, and the lasting power is reasonable if not stellar. The smaller sizes are a bargain — I don't think anyone would complain about the $5 or $12 you would spend to get one of the two smaller bottles (see below). That said, I don't think anyone will smell it and marvel that it can be had at bargain prices, either. I wore it next to the Nicolaï and the Atelier Grand Neroli, and again, the Atelier was the best of the bunch. The Yves Rocher smells a little more like a classic neroli than the sOleil, but it's cleaner and blander than I'd like, and I wouldn't call it lively either. The Nicolaï is the more interesting of the two fragrances, even if it isn't the neroli I was looking for. 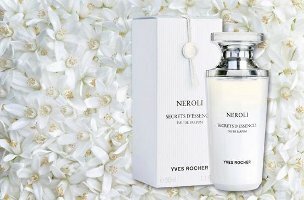 Yves Rocher Néroli was developed by perfumer Véronique Nyberg; the notes feature mandarin, petitgrain, neroli, orange blossom and musk. It is available in 5 ml mini ($5), 15 ml purse spray ($12), 30 (€36, not in US at the moment) and 50 (currently on sale for $38) ml Eau de Parfum. Yves Rocher has frequent sales, so you rarely have to pay full price for anything. If you're looking for a lively neroli and you're willing to pay a bit more, you might try Czech & Speak Neroli, or the bright and cheerful L’Eau de Neroli by Diptyque. I am not a huge fan of the Tom Ford Neroli Portofino, but it's probably worth a shot too. See also: this nice video from Lush showing the production of neroli oil. It nicely explains the difference between neroli (steam distilled) and orange blossom absolute (usually extracted with solvents). The AG is lovely, if I had a bottle would have used that as a “standard” instead of the Atelier. I though the Tendre Jasmin was a disappointment — it’s just ok. The Rose, Amber & Iris were better, IMHO. Can’t remember if I’ve tried the vanilla or not. That’s too bad. The UK & Canadian sites say it’s temporarily out of stock, but you’re probably right that it’s axed. Sounds like you disliked it more than I did, but totally agree it’s not their best. The amber really was terrifically well done, ditto on the rose. This was a lost opportunity — I think they are maybe trying to make more generically “pleasing” fragrances if you know what I mean. absolutely. i really wanted to like it, thought the chemical effect would “wear off”, but no such luck… i liked their rose a lot, too, but amber is the only one i do restock on. I haven’t tried the PdN Neroli or the YR. I do like Atelier’s Grand Neroli, and I remember liking Neroli Portofino, though it’s been some time since I’ve smelled that one. I am curious about the Rocher. I think the only YR fragrance I’ve tried was a sample of Pivoine that someone gave me. It was a little powdery for my taste, but I thought it was well done. Given their prices, I’ve wanted to try more but haven’t gotten around to it. I’ve said it umpteen times so should shut up about it, but really miss the Yves Rocher boutique that used to be reasonably near me. I have not had great luck ordering scents, or any other products, from them untested — even had several shower gels I ended up throwing away because I hated them. So, neroli is one of those notes I don’t immediately recognize, so I’ve dabbed some Grand Neroli on to have a reference sniff. . . I get a whole bunch of lemon at top which becomes the sweet, vaguely powdery floral I associate with orange blossom, although that’s a note I’m still learning, too. Is the “lemon” actually neroli? Hello, MR. 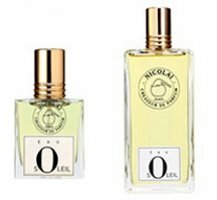 Whenever I smell neroli, I always think of old-fashioned eau de cologne (perhaps because it’s one of the notes often included!). You’re right, it is citrusy and quite fresh, but it also has a honeyed tone and sometimes I think certain fragrances with this in them can remind me a little of cat pee. As much as I love my cats, I don’t want to smell like them. You can buy a little bottle of the essential oil really cheaply, and this gives you the authentic scent (and you can put drops in your bath – it is supposed to be relaxing but uplifting!). You can also buy little samples from someplace like Eden Botanicals. Neroli smells greener, fresher (less indolic), close-ish to petitgrain than does orange blossom. It also has a slightly spicy edge to it. Lots of fragrances use both notes so it’s hard to tell them apart without either a) smelling lots of neroli scents or b) smelling the raw materials separately. Seconding Robin’s recommendation of Eden Botanicals. I buy most of my natural materials from them, and they are great with samples. They have several different types of neroli, from different countries and organic vs. non-organic. They also have orange blossom absolute and petitgrain if you want to compare. Also, if you come across orange blossom water in the grocery store (depending on the store, it can sometimes be found in the cocktail mixers section or with middle eastern imports if your store has a section for that), that can give you a sense of what neroli smells like. I was hoping to try Eau sOleil this summer but unfortunately none of the perfume places in Poland carries Parfums de Nicolai and the brand itself doesn’t offer samples. I don’t buy from decanting sites because they’re far away too and it’s simply not worth it for 1 sample. Thanks for the reviews. I love the Nicolai brand but like Lucas, I can’t try it without purchasing samples from the decant services. I actually do this quite often; it’s not so bad if you bundle up several samples in one order. The trouble is that last time I looked, none of decanters had either Soleil or Folie. I think Luckyscent may sell samples of Folie but the samples are very small. So I’ve been watching the reviews quite closely. I’m a bit relieved that you were disappointed with Soleil because that could be one I could cross off my list. Folie sounds more interesting anyway, and has been very well received, so that would be the one to target. I have to pay hefty shipping fees so Nicolai is not the bargain for me as for other people. Still, a Christmas present to myself, methinks! Annick Goutal is normally my favourite Neroli but I’m wondering of the re-release is weaker than before? The original is not that long-lived on me as it is. It’s really too bad the brand doesn’t sell samples. But would agree Folie is a safer bet. And so sorry but I have not smelled the AG since they relaunched it. I would be worried it wasn’t the same too. I just tried it at Nordstrom the other day. It’s a bit drier, not quite as ethereal, and lasts about as long i.e. not very. I’m a big fan of the original and i’ve hoarded a couple bottles– it’s instant happy juice to me– but i’m planning on buying the new one. I like it. I think it will still be my favorite. Eau Soleil was the same for me: great breezy opening, petered out into a generic floral. Same with Cologne Sologne. Thanks for the reviews, Robin. I had high hopes for Eau sOleil (despite that annoying capitalization of the second letter) and am sorry to hear you found it underwhelming. I will still give it a sniff the next time I find myself among the Nicolais but will not expect it to be my next great love. BTW, I like Atelier Grand Neroli a lot but often layer it with their Orange Sanguine to zip it up. Neroli on its own can smell a bit “flat” to me sometimes. Yes, they are better layered. I think Orange Sanguine is a bit less sparkling than it should be too, though — I bought them both, but usually reach for Guerlain Mandarin Basilic instead. And meant to say — ditto on the capitalization! Hope you will like it anyway.